Journal #11: Quito, Popallacta, Baeza, Coca, and everything in between. A lot had happened since the last time I’d been on the bike for an extended period of time, none more important than the acquisition of a new riding partner, Bibiana Robles. It had been 15 years since Bibiana had ridden a bicycle, and never having driven a car, there was a learning curve that needed to be tackled in a hurry. Thankfully, she demonstrated right out of the gate she was up to the task. The first night after her bike was ready, we met some guys that were leading a group night ride up to El Panecillo. This was just 3 days prior to Christmas, and I didn’t like the idea of riding at night, but we had a group with us, she was determined, and I admired her moxy. So up we went. The trip was slow going, and she got to feel what it was like right off the bat to get owned by a mountain, as well as what slick, traffic packed roads can do to a ride. The climb was just about 250 meters, but they were steep enough and traffic was so congested that even I didn’t feel comfortable riding down, much less up. Still, she took to the culture immediately. The lead riders were younger, for the most part, throwing firecrackers behind them throughout the trip and graffiti-ing bicycle with spray paint throughout the trip on the concrete as we passed. Chris and I enjoyed seeing that there was something that resembled critical mass and bike culture that exists in urban south America. Bibi and I came down from the mountain with the group sans Chris who had jetted off early, and had drinks and pizza in downtown Quito. The next morning she was soar, but ready to go again. It was Sunday, so Amazonas was closed off to traffic for the ciclovia. We did what I suspect was about a 20km ride, which we both really enjoyed. Biking is always sweet when you get rid of the cars. On Christmas day, Bibi went up to Otavalo to meet a friend, and I talked Chris into riding the first 10kms of so of the route Bibi and I would be taking the following morning to leave town. He did this reluctantly, and frankly it wasn’t much of a ride. City. Traffic. Etc. It’s never fun trying to get out of the city. It just goes on and on. But it did help me get a sense of where we were going the next morning, when I would have other things on my mind. Chris and I proceeded to gorge ourselves on southern style Buffalo wings to celebrate the Navidad with a truly gringo experience. 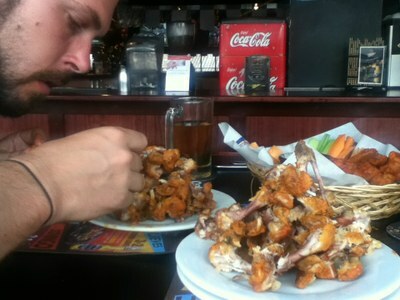 Together we put away 74 wings before our stomachs got the final say and our willpower gave way. That night, Bibi returned, and Chris and I said our final goodbye. It was brief, but there was no point drawing it out. We’d waxed ecstatic a couple nights prior and there wasn’t much more left to say. I’d miss him. I was sorry how things had ended for him, and more sorry that he wasn’t going to be joining me. I had a bike partner that I could count on with Chris. One who knew the ropes, could manage his own gear, problem solve and trouble shoot, etc. I also had a friend who had the ability to bridge the divides that time and distance create in our lives. But it was not to be. The next morning Bibi and I set out, and immediately got off to a rough start. On her first downhill, she lost control of the bike. I watched it fishtail for 4-5 seconds before she wiped out. Thankfully I was behind her. I stopped and signaled for traffic to do the same. Out of the road I screamed. I don’t remember if I did so in English or Spanish. She had good sized cut on her knee and a busted toenail, but seemed to be in one piece. We got her bandaged up, and made our way to our first rest stop, a lookout point to the north of Quito to catch our breath. What have I gotten myself into. She was all smiles, but she would be much more cautious about her speed on downhill stretches going forward. We made about 35kms that first day, but it was enough to get us out of the city. Before the ascent really got underway, we found a cheap hostel and called it a night. Ok. We’re still good. Nothing catastrophic. Our next destination was Popallacta, a hot spring retreat just 70 kms from Quito. Unfortunately there was a 4100m pass and a 1500m ascent standing between us. Bibi wanted to stick with the plan to the jungle, despite my warnings that this was not a beginners ride. She learned what I meant that second day, walking her bike 90% of the mere 11kms we made. I saw her will beginning to fade, and with no hotels in range, we made camp. She wanted to help set up, but I laid a sleeping bag and pillow in the sun and pointed her to it. She drifted right off into napland while I rounded up wood for a fire. It was a cold night, but we awoke ready to go in the morning and were on the road again before 8am. The pass to Popallacta was freezing cold, with strong winds, minimal visibility, and poor roads. At a certain elevation it became too cold to take breaks, so we pushed through, saying little for 2 hours other than sigue and the remaining meters we had to climb. We finally made it to the pass where we found a little shrine. Bibi lit a candle, which I believe were meant to be lit in memory of past loved ones, and used it to warm her hands. I was too tired and cold to comment. We took a picture, and got the heck off that mountain as soon as we could. We rolled down to Popallacta, checked into a hostel, and immediately headed for the hot spring pools. Bibi now understands why cyclists love hot springs. They always seem to be located in cold places and at high elevations. Right where bicyclists need them most. We took a day off the next day to recover and watch the UK – Louisville basketball game. It was the first game I’d seen since last year’s championship team knocked off Kansas. It was a close game against a great team. We’ll be ready in March. It was the 30th when we set out again. The day was mostly descents, but Bibi was extra cautious after that fall her first day, so we made poor time. There was only one town before we would be deep in the jungle, so when we passed through Baeza, we decided to hole up there. Had a great dinner that night at a pizza place run by a guy from Holland along with margaritas. We got a late start the next morning (perhaps due to the previous evening’s tequila, which was compounded by Bibi’s need to check in with her family and wish them a Happy New Year and let them know she was safe. It took a while finding internet, but we eventually stumbled upon a hotel that let us use their wifi for a few minutes. Then we were off. It was another slow day, but I wasn’t going to push too hard and invite an accident or early burnout. Each day we showing progress. The day was an entertaining one as well. There is a tradition in both Ecuador and Colombia on New Years to make lifesize “dolls” out of old cloths and straw. Many of these dolls are modeled after drunks it seemed. The dolls were paraded around everywhere. Shop owners had them sitting on the doorsteps, cars plastered them to the front of the hoods as they drove past. Oftentimes groups of them would be sitting together, conversing as it were. At midnight, the dolls are burnt to ring in the New Year. There were also various road blocks set up along the way, in which the members of these small villages dressed in masks and costumes, and dancing to loud stereo music would demand a fee for opening up the gate. We were immune to this as bicyclists, but we saw numerous cars pay the fee in order to continue their journey. That night, exhausted, we pitched our tent in a crossroads village where the road splits – right to Tena and left to Coca. The little village that was located there was wholly uninterested in us, and with no restaurants open on the holiday, it was all we could do to get some tuna sandwiches together for dinner. We would be eating Tuna sandwiches almost exclusively for the next 2 days as well. We went to sleep early, unable to integrate into the party, and passed the night listening to the same 13 tracks of horrible jungle pop music. The villagers seemed to love it though, and they were still dancing when we awoke, packed, and got the hell out of there at dawn the following morning. The next day was our first true day in the jungle. We only passed a couple small pueblitos the entire day, and none with restaurants. We made short work of our tuna sandwiches and made relatively good time, in the absence places to stop. It was Bibi’s first 60km day. The sounds of the jungle and birds were a treat to me, along with the absence of major hills. The villagers however weren’t especially friendly. Around 5:30 we found a pueblito and the owners of a little store allowed us to put our tent alongside their shop. Everyone was still drinking from the night before. I bought a couple rounds to secure a level of hospitality. There were two guys in our little village that hung close to us once we arrived: one who couldn’t speak through some disability and another who couldn’t speak coherently due to his inebriation. After a short time, Bibi retreated to the tent, while I talked to them both with little comprehension on either side. It stormed hard that night, but we stayed dry, and hit the road early again the next day. We made great time through the jungle the following day (90kms) to arrive in Coca in the afternoon. The trip from Quito to Coca had taken us 7 days of riding, for 310kms. Slow going, but given the terrain and Bibi’s biking experience, I felt good about it. Above all else, she was positive nearly throughout and there were no major accidents. In Coca, we secured our boat into la selva, and I caught up on emails, journals, meetings. All is well in the jungle.